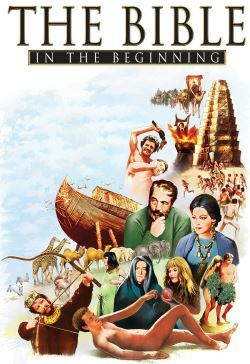 An elaborate Hollywood retelling of the Bible stories narrated by the film's director John Huston. We open with the Creation of the World and arrive at the Garden of Eden with Adam and Eve and continue on to Cain and the murder of Abel. Next, we visit Noah and his ark with its spectacular flood sequence. Then we come to the story of Nimrod, King of Babel, the emergence of man's vanity and the heights to which it could aspire if unchecked. Finally we cover Abraham, a mystic who spoke personally with God, a leader of men, a builder of nations, a pioneer and a warrior and Sarah. At the time she conceived her first child, the event being forecast by an Angel of the Lord. Three such Heavenly Messengers appeared in the course of events which befell Abraham and Sarah.